Twenty years ago, Neon Genesis Evangelion was introduced to the world. Since its inception, the series has spawned various movies, spinoffs, figures, theme park attractions, underwear, and even buckets. It’s a phenomenon that changed the anime industry and inspired many creators in the process. For those of you who either aren’t anime nerds, born too late, or have lived under a rock for the past twenty years, the series revolves around three teenagers who must pilot giant robots in order to save humanity from creatures called Angels. The series has a modest start, focusing purely on a story of a boy trying to save the world, but grows much deeper as the show goes on. I haven’t been with the series since day one (I would have been six years old), but I have been a diehard fan for well over a decade now. I originally watched the show at the age of 14, the same age as the protagonist of the series, Shinji Ikari. I was in middle school (as mentioned in one of my other blogs as the worst time in my life), so I would say around the same time I got into the Xenosaga video game series (a blog for another time…). My older sister worked at the public library, so, from time to time, she would check out something for my brother and me. Our anime kick was in full swing around this time, what with Toonami and Adult Swim introducing us to the world. One fateful day, our sister just so happened to check out the Neon Genesis Evangelion boxset for us, changing my life forever. You might wonder why I am so obsessed with this show. Do I simply like it because of its popularity? For the giant robot action? For the random religious references? To be fair, a few of those questions have a bit of truth to them (except the popular part, since I didn’t know what it was and I didn’t have internet at home until a few years later), but the real reason I love the series so much is because of the characters. From the fiery attitude of Asuka to the immense self-hatred surrounding Shinji, I fell in love with these kids who were the exact same age as me. There were so many characters I related to, and even now I feel myself relating to more of the cast as I grow older. Today I will focus primarily on a single character, but I intend to elaborate on more in future installments. Otherwise, I will write a 20 page essay that will bore the crap out of you. Asuka, the fiery red head of the series, is a character I was surprised by how much I could relate to her. A part German and Japanese Eva pilot, Asuka is introduced a little later than the other characters of the series. However, her late introduction does nothing to impair her character. She’s sassy, self-confident, and a college graduate at the age of fourteen. She sounds like she has everything going on with her life. But behind her bravado is a damaged girl looking for acceptance. She wants to prove herself not only on the battlefield but as a human being. 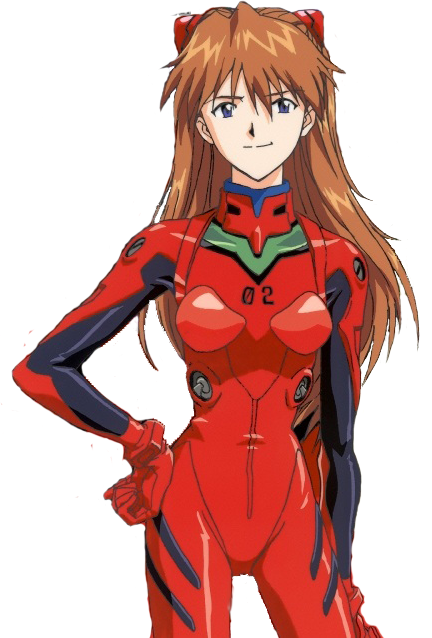 Her inferiority complex is only exasperated by Shinji Ikari, who not only defeated an Angel the first time he piloted but also became an overall better pilot than Asuka. Kaji denies her advances, as he is a man much, much older than her, but Asuka still sees herself as this strong adult. During her childhood, her mother took part in the Evangelion experiments, causing her to go insane. She started to ignore her daughter’s existence, putting all of her love and attention on a doll instead. Before Asuka could prove herself, she walked in on her mother’s suicide. Asuka’s desperate need to be strong, self-sufficient, and the best stem from this very moment. Yeesh, you might say. How do I resonate with such a character? I don’t have a tragic backstory like her nor a flamboyant and strong personality. But I do feel for her. As a twin, as I’ve mentioned before, I had my fair share of insecurities. In comparison to my brother, I felt inferior, unnecessary. Unlike Asuka, I didn’t strive to prove myself. But, like Asuka, I hid my feelings from everyone. Like her, I was too proud to talk about my feelings or even come to an understanding with the one person that I felt inferior to. I have since overcome these feelings (granted, clarity didn’t come in a giant robot fight against nine other robots ala Asuka), but I will always remember that time in my life. If anything, watching Evangelion at that critical time in middle school made me realize those feelings and deal with them a lot quicker than I would have without it. To be honest, I didn’t really like Asuka that much when I originally watched the show. I felt she was too cocky, too mean, especially to Shinji. Her relationship with Kaji seemed awkward and sadly one-sided. However, after finishing the show and letting the years pass, I realize how much I sympathized with Asuka. She was like me, a teenager thrown in to the arms of puberty. It’s a confusing and hectic time, and throwing other people into the mix can either help or damage you. At my worst, I hated everyone, the people I went to school with, society, and most of all, myself. Asuka made me realize that other people can feel the same way, but also that it can be overcome. So, to you, Asuka, you red-haired demon, I thank you from the bottom of my heart for realizing my own insecurities. Asuka is probably my favorite character in the series. She's so extreme in both her fiery attitude and her insecurities that it's hard not to feel for her. I also love her moments of badassery in The End of Evangelion.